In this final post on the basic four methods of proof (but perhaps not our last post on proof methods), we consider the proof by induction. For all natural numbers n, . Of course, there are many ways to prove this fact, but induction relies on one key idea: if we know the statement is true for some specific number , then that gives us information about whether the statement is true for . If this isn’t true about the problem, then proof by induction is hopeless. Indeed, this is precisely what we’re looking for! It’s what happens when you replace by in the original statement of the problem. At this point we’re very close to being finished. We proved that if the statement is true for , then it’s true for . And by the same reasoning, it will be true for and all numbers after . But this raises the obvious question: what’s the smallest number that it’s true for? For this problem, it’s easy to see the answer is . A mathematician would say: the statement is trivially true for (here trivial means there is no thinking required to show it: you just plug in and verify). And so by our reasoning, the statement is true for and so on forever. This is the spirit of mathematical induction. Now that we’ve got a taste of how to use induction in practice, let’s formally write down the rules for induction. Let’s have a statement which depends on a number , and call it . This is written as a function because it actually is one (naively). It’s a function from the set of natural numbers to the set of all mathematical statements. In our example above, was the statement that the equality holds. The basic recipe for induction is then very simple. Say you want to prove that is true for all . First you prove that is true (this is called the base case), and then you prove the implication for an arbitrary . Each of these pieces can be proved with any method one wishes (direct, contrapositive, contradiction, etc.). Once they are proven, we get that is true for all automatically. Indeed, we can even prove it. A rigorous proof requires a bit of extra knowledge, but we can easily understand the argument: it’s just a proof by contradiction. Here’s a quick sketch. Let be the set of all natural numbers for which is false. Suppose to the contrary that is not empty. Every nonempty set of natural numbers has a smallest element, so let’s call the smallest number for which is false. Now , so must be true. But we proved that whenever is true then so is , so is true, a contradiction. Besides practicing proof by induction, that’s all there is to it. One more caveat is that the base case can be some number other than 1. For instance, it is true that , but only for . In this case, we prove is true, and with the extra assumption that . The same inductive result applies. Here are some exercises the reader can practice with, and afterward we will explore some variants of induction. Prove that for all the following equality holds: . Prove that for every natural number , a set of elements has subsets (including the empty subset). This last exercise gives a hint that induction can prove more than arithmetic formulas. Indeed, if we have any way to associate a mathematical object with a number, we can potentially use induction to prove things about those objects. Unfortunately, we don’t have any mathematical objects to work with (except for sets and functions), and so we will stick primarily to proving facts about numbers. One interesting observation about proof by induction is very relevant to programmers: it’s just recursion. That is, if we want to prove a statement , it suffices to prove it for and do some “extra computation” to arrive at the statement for . And of course, we want to make sure the recursion terminates, so we add in the known result for . The first variation of induction is simultaneous induction on multiple quantities. That is, we can formulate a statement which depends on two natural numbers independently of one another. The base case is a bit trickier, but paralleling the above remark about recursion, double-induction follows the same pattern as a two-dimensional dynamic programming algorithm. The base cases would consist of all and all , and the inductive step to get requires and (and potentially or others; it depends on the problem). which is obviously again an integer. In order to fill the values in the next column (prove the statement for those values of ), we need to fill the entire column (for indeed, we rely on the inductive hypothesis for both the and row). But since our base case was the entire column, we can fill the entire table. In fact, we have just described a dynamic programming algorithm for computing the value of in steps. The correctness of the algorithm is indeed an inductive proof of the theorem. At this point, we have noticed that we sometimes use induction and assume that many smaller instances of the statement are true. Indeed, why not inductively assume that the statement holds for all smaller . This would certainly give the prover more tools to work with. Indeed, this technique is sometimes called strong induction, in the sense that we assume a stronger inductive hypothesis when we’re trying to prove . It may not be entirely obvious (especially to one well versed in the minutiae of formal logic) that this is actually equivalent to normal induction, but it is. In fact, the concept of “strong” induction is entirely pedagogical in nature. Most working mathematicians will not mention the difference in their proofs. The last variant we’ll mention about induction is that of transfinite induction. The concept is that if you have any set which is well-ordered (essentially this means: allowing one to prove induction applies as we did earlier in the post), then we can perform induction its elements. In this way, we can “parameterize” statements by elements of an arbitrary well-ordered set, so that instead of being a function from natural numbers to mathematical statements, it’s a function from to mathematical statements. One somewhat common example of when is something besides natural numbers is when we use the so-called cardinal numbers. We have already seen two distinct infinite cardinal numbers in this series: the cardinality of the integers and the cardinality of the real numbers (indeed, “cardinal number” just means a number which is the cardinality of a set). It turns out that there are many more kinds of cardinal numbers, and you can do induction on them, but this rarely shows up outside of mathematical logic. And of course, we should close this post on an example of when induction goes wrong. For this we point the reader to our proof gallery, and the false proof that all horses are the same color. It’s quite an amusing joke, and hopefully it will stimulate the reader’s mind to recognize the pitfalls that can occur in a proof by induction. In this post we’ll expand our toolbox of proof techniques by adding the proof by contradiction. We’ll also expand on our knowledge of functions on sets, and tackle our first nontrivial theorem: that there is more than one kind of infinity. Many of the most impressive results in all of mathematics are proofs of impossibility. We see these in lots of different fields. In number theory, plenty of numbers cannot be expressed as fractions. In geometry, certain geometric constructions are impossible with a straight-edge and compass. In computing theory, certain programs cannot be written. And in logic even certain mathematical statements can’t be proven or disproven. Assume the claim you want to prove is false, and deduce that something obviously impossible must happen. There is a simple and very elegant example that I use to explain this concept to high school students in my guest lectures. Image you’re at a party of a hundred people, and any pair of people are either mutual friends or not mutual friends. Being a mathematical drama queen, you decide to count how many friends each person has at the party. You notice that there are two people with the same number of friends, and you wonder if it will always be the case for any party. And so the problem is born: prove or disprove that at every party of people, there exist two people with the same number of friends at the party. If we believe this is true, and we can’t seem to find a direct proof, then we can try a proof by contradiction. That is, we assume that there are not two people with the same number of friends. Equivalently, we can assume that everybody has a distinct number of friends. Well what could the possibilities be? On one hand, if there are people at the party, then the minimum number of friends one could have is zero (if you’re quite lonely), and the maximum is (if you’re friends with everybody). So there are distinct numbers, and people, and everyone has to have a different number. That means someone has to have zero friends, and someone has to be friends with everybody. But this can’t possibly be true: if you’re friends with everyone (and we’re only counting mutual friendships) then nobody can be friendless. Thus, we have arrived at a contradiction, and our original assumption must have been incorrect. That is, every party has two people with the same number of friends at the party. There are certainly other proofs of this fact (I know of a direct proof which is essentially the same proof as the one given above), and there are more mathematical ways to think about the problem. But this is a wonderful example of a proof which requires little else than the method of contradiction. We notice that an implication can only be false if the hypothesis is true and the consequence is false. This is the motivation for a proof by contradiction: if we show this case can’t happen, then there’s no other option: the statement must be true. In other words, if supposing “p and not q” is true implies something which we know to be false, then by the very same truth table argument it must be that either “q” is true or “p” is false. In any of these cases “p implies q” is true. But all of this truth table juggling really takes us away from the heart of the method. Let’s do some proofs. First, we will prove that the square root of 2 is not a rational number. That is, we are proving the statement that if is a number such that , then it cannot be true that where are integers. Suppose to the contrary (this usually marks the beginning of a proof by contradiction) that is a ratio of integers. Then we can square both sides to get , and rearrange to arrive at . Now comes the tricky part: if a number is a divisor of , then its square must divide ; this is true of all square numbers. In particular, it must be the case that the largest power of 2 dividing any square number is even (and counts as an even power). Now in the equation the right hand side is a square, so the largest power of two dividing it is even, and the right hand side is two times a square, so the largest power of 2 dividing it is odd (2 times an even power of 2 gives an odd power of two). But the two sides are equal! They can’t possibly have different largest powers of 2 dividing them. So we have arrived at a contradiction, and it must not be the case that is rational. This is quite a nice result, and a true understanding of the proof comes when you see why it fails for numbers which actually do have rational square roots (for instance, try it for the square root of 9 or 36/25). But the use of the method is clear: we entered a magical fairy land where the square root of 2 is a rational number, and by using nothing but logical steps, we proved that this world is a farce. It cannot exist. Often times the jump from “suppose to the contrary” to the contradiction requires a relatively small piece of insight, but in other times it is quite large. In our example above, the insight was related to divisors (or prime factorizations) of a number, and these are not at all as obvious to the layman as our “having no friends” contradiction earlier. For instance, here is another version of the square root of two proof, proved by contradiction, but this time using geometry. Another example is on tiling chessboards with dominoes (though the application of the proof by contradiction in this post is more subtle; can you pick out exactly when it’s used?). Indeed, most proofs of the fundamental theorem of algebra (these are much more advanced:    ) follow the same basic recipe: suppose otherwise, and find a contradiction. Instead of a obviously ridiculous statement like “1 = 0”, often times the “contradiction” at the end of a proof will contradict the original hypothesis that was assumed. This happens in a famous proof that there are infinitely many prime numbers. Indeed, if we suppose that there are finitely many prime numbers, we can write them all down: . That is, we are assuming that this is a list of all prime numbers. Since the list is finite, we can multiply them all together and add 1: let . Indeed, as the reader will prove in the exercises below, every number has a prime divisor, but it is not hard to see that no divides . This is because no matter what some number is, no number except 1 can divide both and (one can prove this fact by contradiction if it is not obvious), and we already know that all the divide . So must have some prime divisor which was not in the list we started with. This contradicts that we had a complete list of primes to begin with. And so there must be infinitely many primes. Prove that the base 2 logarithm of 3 is irrational. More generally that is irrational if there is any prime dividing but not , or vice versa. Prove the fundamental theorem of arithmetic, that every natural number is a product of primes (hint: inspect the smallest failing example). Last time we defined what it means for a function on sets to be injective: different things in get mapped to different things in . Indeed, there is another interesting notion called surjectivity, which says that “hits” everything in by something in . Definition: A function is surjective if for every element there is an for which . A surjective function is called a surjection. A synonym often used in place of surjective is onto. For finite sets, we use surjections to prove something nice about the sets it involves. If is a surjection, then has at least as many elements as . The reader can prove this easily by contradiction. In our previous post we proved an analogous proposition for injective functions: if is injective, then there are at least as many elements of as there are of . If we combine the two notions, we can see that and have exactly the same size. Definition: A function which is both injective and surjective is called a bijection. 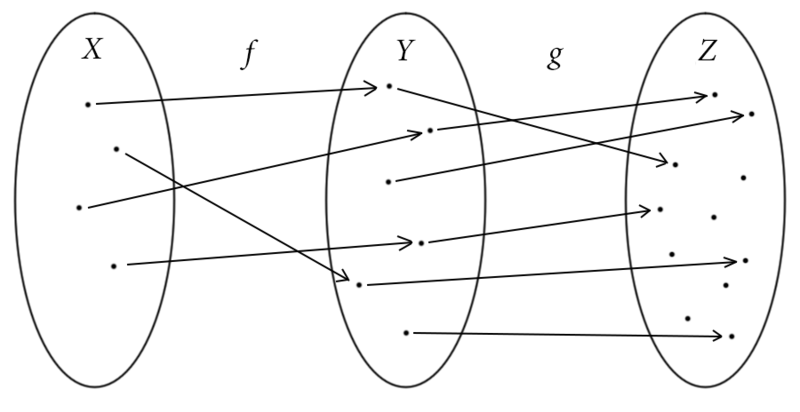 The adjectival form of bijection is bijective. So for finite sets, if there exists a bijection , then and have the same number of elements. The converse is also true, if two finite sets have the same size one can make a bijection between them (though a strictly formal proof of this would require induction, which we haven’t covered yet). The main benefit of thinking about size this way is that it extends to infinite sets! Definition: Two arbitrary sets are said to have the same cardinality if there exists a bijection . If there is a bijection then is said to have countably infinite cardinality, or simply countably infinite. If no such bijection exists (and is not a finite set), then is said to be uncountably infinite. So we can say two infinite sets have the same cardinality if we can construct a bijection between them. For instance, we can prove that the even natural numbers have the same cardinality as the regular natural numbers. If is the set of even natural numbers, just construct a function by sending . This is manifestly surjective and injective (one can prove it with whatever method one wants, but it is obviously true). A quick note on notation: when mathematicians want to define a function without giving it a name, they use the “maps to” arrow . The reader can think of this as the mathematician’s version of lambda expression. So the above map would be written in python: lambda x: 2*x. So we have proved, as curious as it sounds to say it, that there are just as many even numbers as all natural numbers. Even more impressive, one can construct a bijection between the natural numbers and the rational numbers. Mathematicians denote the latter by , and typically this proof is done by first finding a bijection from and then from . 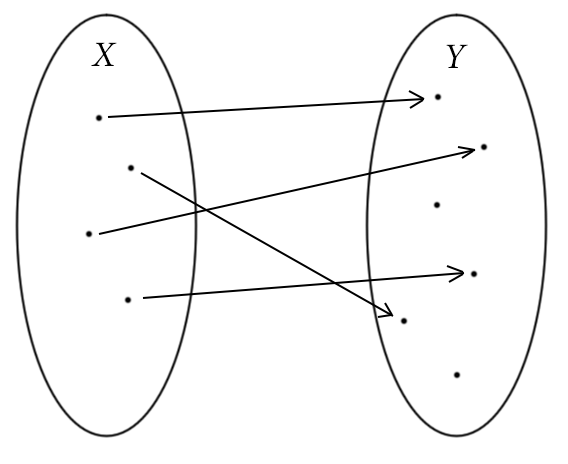 We are implicitly using the fact that a composition of two bijections is a bijection. The diligent reader has already proved this for injections, so if one can also prove it for surjections, by definition it will be satisfied for bijections. We now turn to the last proof of this post, and our first non-trivial theorem: that there is no bijection between the set of real numbers and the set of natural numbers. Before we start, we should mention that calling this theorem ‘non-trivial’ might sound insulting to the non-mathematician; the reader has been diligently working to follow the proofs in these posts and completing exercises, and they probably all feel non-trivial. In fact, mathematicians don’t use trivial with the intent to insult (most of the time) or to say something is easy or not worth doing. Instead, ‘trivial’ is used to say that a result follows naturally, that it comes from nothing but applying the definitions and using the basic methods of proof. Of course, since we’re learning the basic methods of proof nothing can really be trivial, but if we say a theorem is non-trivial that means the opposite: there is some genuinely inspired idea that sits at the focal point of the proof, more than just direct or indirect inference. Even more, a proof is called “highly non-trivial” if there are multiple novel ideas or a menagerie of complicated details to keep track of. In any case, we have to first say what the real numbers are. Instead we won’t actually work with the entire set of real numbers, but with a “small” subset: the real numbers between zero and one. We will also view these numbers in a particular representation that should be familiar to the practicing programmer. Definition: The set of is the set of all infinite sequences of zeroes and ones, interpreted as the set of all binary decimal expansions of numbers between zero and one. Definition: An infinite binary sequence is a function where we denote by the value . So now we can state the theorem. Theorem: The set of infinite binary sequences is uncountably infinite. That is, there is no bijection . Now here is the tricky part. We are going to define a new binary sequence which we can guarantee does not show up in this list. This will be our contradiction, because we assumed at first that this list consisted of all of the binary sequences. The construction itself is not so hard. Start by taking for all . That is, we are using all of the diagonal elements of the table above. Now take each and replace it with its opposite (i.e., flip each bit in the sequence, or equivalently apply to each entry). The important fact about this new sequence is it differs from every entry in this table. By the way we constructed it, no matter which $lateex n$ one chooses, this number differs from the table entry at digit (and perhaps elsewhere). Because of this, it can’t occur as an entry in the table. So we just proved our function isn’t surjective, contradicting our original hypothesis, and proving the theorem. The discovery of this fact was an important step forward in the history of mathematics. The particular technique though, using the diagonal entries of the table and changing each one, comes with a name of its own: the diagonalization argument. It’s quite a bit more specialized of a proof technique than, say, the contrapositive implication, but it shows up in quite a range of mathematical literature (for instance, diagonalization is by far the most common way to prove that the Halting problem is undecidable). It is worth noting diagonalization was not the first known way to prove this theorem, just the cleanest. The fact itself has interesting implications that lends itself nicely to confusing normal people. For instance, it implies not only that there is more than one kind of infinity, but that there are an infinity of infinities. Barring a full discussion of how far down the set-theory rabbit hole one can go, we look forward to next time, when we meet the final of the four basic methods of proof: proof by induction.